These cookies were inspired by a friend who loves all things red velvet and requested some red velvet cookies. While I have a few other recipes for red velvet cookies, I wanted to test a new idea – using cheesecake flavored pudding mix and cocoa powder to mimic the buttermilk/vinegar/cocoa powder flavors of traditional red velvet cake. Using a recipe for Chocolate Chip Pudding Mix Cookies as a start, I substituted a little cocoa powder for some flour, used cheesecake flavored instant pudding, a few big drops of red food paste and white chips. The cookies turned out exactly as I’d hoped, with a cheesecake/cocoa flavor that’s pretty close to red velvet. These are pretty easy to make, but I do recommend using a stand mixer if you have one because the dough is quite thick. Here’s the recipe if you want to give it a try! Also, if you read this and are thinking you don’t want red velvet cookies but you would like to try chocolate chip cookies made with pudding mix, I recommend these cookies with pudding mix. This version of pudding mix cookies is not actually the one I used to make the red velvet version, but it’s my current favorite of all pudding mix cookies. 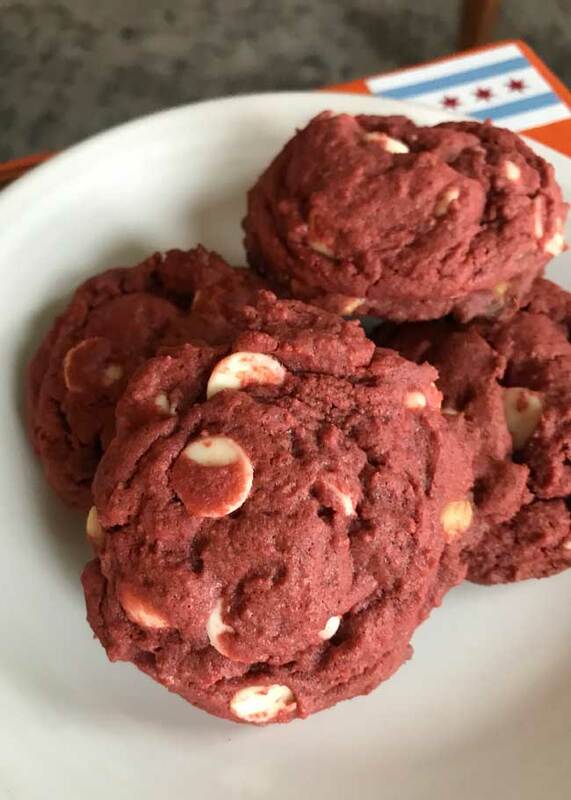 Red Velvet Cookies made with cheesecake flavor instant pudding mix. Mix together the flour, cocoa powder, baking soda and salt and set aside. In the bowl of a stand mixer with the paddle attached, combine softened butter, both sugars, and vanilla. Beat until smooth and creamy. Beat in eggs, one at a time, then add a few drops of red food paste or enough to give you a bright red color (not pink!). Add pudding mix and beat until blended. Gradually add flour mixture and mix on low or medium low until you have a thick, red dough. Stir in chips. Using a medium size cookie scoop, scoop up about 28 balls for dough and arrange 2 ½ inches apart on ungreased baking sheets. Bake one sheet at a time for 10-12 minutes or until cookies appear set. Let cookies cool for about 5 minutes on baking sheets, then transfer to a wire rack and let cool completely. I used AmeriColor soft gel paste. I think I got it from King Arthur Flour. I didn’t realize how low on red I was. I think I simply didn’t use enough. The cookies are still attractive enough to serve and enjoy. Thanks for trying to cookies! I just put in the baking temp of 350, so thanks for mentioning that. For the red I used a special food coloring I order from Amazon called Super Red, and it took quite a bit. I guess for coloring the best bet is to use either Super Red from Amazon (or a cake decorating shop) or one of the Wilton pastes such as Christmas red. I haven’t tested it with liquid food color or gel from the grocery store (like McCormick). Is that what you used? I made these today and baked a couple of them. I’m putting the rest of the pre portioned dough in the freezer to bake closer to Christmas. They turned out really great. Next time I’ll add more food color because mine aren’t quite as pretty as yours. Definitely glad I have a stand mixer because the dough is really thick. I think these will be a hit with the red velvet lovers. I might be looking right at it but I don’t see a baking temperature in the recipe. And in case I can’t post stars I’d rate this recipe a five. Yes, you could definitely do that! I’d keep the white chips and then do the melted white chocolate and sprinkles as an addition. You can also make red velvet cookies with red velvet cake mix. My daughter in law might like these a lot as she is a big fan of red velvet cake. How sad it is that I didn’t even know there is such a thing as cheesecake flavored pudding mix. Lol! I wonder if you could melt a little white chocolate and then sprinkle with red and green sprinkles and make them look more like Christmas cookies? Maybe that’s just cheesy?